The centre will be an effort towards preserving the critically endangered species in the world. Following the success of a pilot project on captive rearing of White-bellied Heron in 2011, the species will now be captured, bred and reared at a permanent captive breeding centre under special care. Of the total 15 confirmed breeding pairs of White-bellied Heron in the world, 5 breeding pairs are spotted in Bhutan along Phochhu, Hara Rongchhu in Wangdue, Burichhu in Tsirang and Bertichhu in Zhemgang. “The egg was lifted from the wild nest, incubated and kept in captivity. After 134 days in captivity, the bird was successfully released in the wild. It was a successful experiment. Based on this, we think this approach can help us revive the population in the world,” said the Project Officer of RSPN, Indra Pradsad Acharja. White-bellied Heron breeds once a year. They breed on chirpine trees at a height of 15 to 20 metres along the river banks. Although the species was spotted in Bhutan early in 1976 along Pho Chhu, its nest was spotted for the first time in 2003 at Athang Gewog in Wangdue Phodrang. Three live nests were spotted in 2016 from which six juveniles hatched. 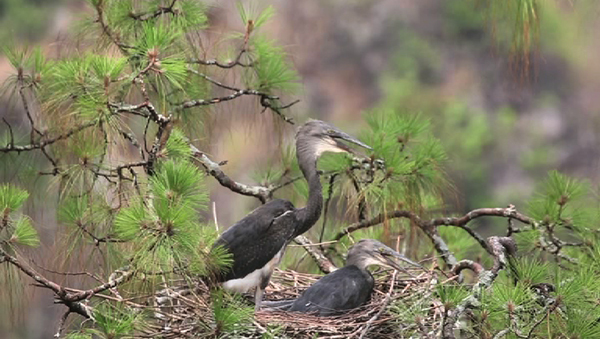 The White-bellied Heron nest was last sighted in Myanmar in 1929. The captive breeding centre will enable conservation and protection of the species by facilitating research, monitoring and habitat restoration. Royal Society for Protection of Nature carries out population survey of the species annually since 2003. But there is still no data on breeding, habitat change and lifespan of the heron. “We do annual population survey and total adult population we have remains same like around 25 to 26 and 30 at the maximum. The main doubt here is though the juveniles are produced annually, we do not know why the population remains constant,” added the Project Officer. Captive breeding centre is one of the projects under the Royal Society for Protection of Nature’s White-bellied heron Recovery Plan project. The ground breaking ceremony for the centre was held on January 27. The captive centre is expected to be complete by 2018 and operational by 2019. Punatsanchhu Hydropower Project is funding the establishment of the breeding centre. The centre, covering over 18 acres, will cost more than Nu 46 M.